It’s our mission to help you keep your teeth healthy for as long as possible. Sometimes, the best way to ensure optimal oral health is to have problematic teeth removed. Having a tooth pulled can range from a simple procedure to a more tedious oral surgery. The type of extraction you’re having will determine the specific steps we take to keep you comfortable. For instance, a simple extraction will usually only require local anaesthetic to numb the area around your tooth. If you’re feeling anxious, we may also recommend nitrous oxide (laughing gas) to help you relax. 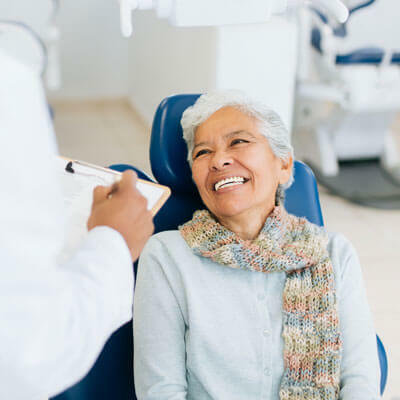 More complex procedures like wisdom tooth removal may need a deeper level of sedation to ensure the highest level of comfort during a longer appointment. To reduce your risk of post-operative discomfort or infection, plan to stick to a soft diet for the first few days. Take all of your medication as directed. During the first 24 hours, plan to have a cold compress handy to reduce any swelling. Avoid drinking through a straw, smoking, tobacco products, alcohol and carbonated beverages for the first week or two to reduce your risk of developing a painful dry socket. If you experience any signs of infection or severe swelling, contact our office immediately. Each tooth helps to hold its neighbours in alignment. Even opposing teeth in the opposite arch rely on their biting partner to stay in the correct position. Losing a tooth creates extra space inside of your mouth, causing adjacent teeth to start leaning or tilting over. Opposing teeth often “super erupt” in such cases. To avoid changes in your bite alignment, we’ll recommend replacing your extracted tooth in a timely manner. Options such as fixed dental bridges, dental implants or a removable partial denture are all worth considering. Do you need to have a tooth pulled? Speak with our family-friendly dental team today.